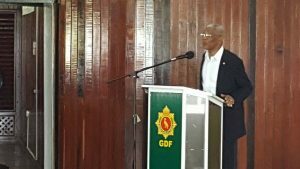 The Ministry of the Presidency early Thursday evening clarified that President Granger did not refer to street protests in his address to Guyana Defence Force (GDF) officers at the annual officers’ conference. Other than the PPP, there have been no other strident call for supporters of any other political party or organisation to respond with protests, but the Ministry of the Presidency called for a retraction of the earlier report by Demerara Waves Online News. The Ministry of the Presidency said the Head of State spoke of the need for internal security and stability to be maintained and his exact words were as follows: “Threats might arise, however, from elements who wish to undermine internal security. Reckless remarks about an uprising and provocative calls for the mobilisation of foot soldiers have the potential to rip apart the fragile fabric of social cohesion that we enjoy”. “At no point did the Head of State mention or make reference to any specific incident or comments regarding street protests, the Ministry therefore calls for a retraction of the Demerara Waves article,” the Ministry of the Presidency added. Demerara Waves never stated the President referred to any specific incident or comments on street protests, but placed it in the context of recent statements by top PPP leaders. Recently, PPP Executive Member Dr. Roger Luncheon warned that the closure of more estates would lead to protests in the sugar industry. “There is no doubt in or mind even if the People’s Progressive Party is not in the forefront of leading the protests against this arbitrary course that this government is undertaking, we can assume that the same sentiment that put the protesters on the streets of Georgetown will have protesters all over the sugar belt were this course of action to be continued,” he said. The Guyanese leader’s concern about the implications of certain utterances for national unity came against the background of recent calls by the opposition People’s Progressive Party (PPP) for its supporters to take to the streets if sugar estates are closed and workers lose their jobs. Opposition Leader, Bharrat Jagdeo at Babu John on Sunday, March 5, 2016 put his party’s supporters on alert if the President goes ahead and unilaterally appoints a Chairman of the Guyana Elections Commission (GECOM) unilaterally.